Does this device to restrict access to roads have a generic name? I'm sure we've all seen these devices which can "lock" and "unlock" vehicle entry and exit to an alley / road /etc. They consist of one or several hefty steel or concrete "pillars" less than a metre high which can be lowered into the road surface. They are strong enough that most vehicles couldn't just drive through them, at least not without substantial damage. But they let pedestrians and cyclists, perhaps even motorcycles, pass through easily. Some like the one pictured have a place where somebody in a vehicle can use a keycard or such to gain access. Others I assume can only be opened by some remote access technology or perhaps by mechanical means. In any case I don't know how to read up on them because all my attempts at Googling their characteristics to find a name have failed so far. Retractable or "rising" bollards can be lowered entirely below the road surface (generally using an electric or hydraulic mechanism) to enable traffic to pass, or raised to block traffic. 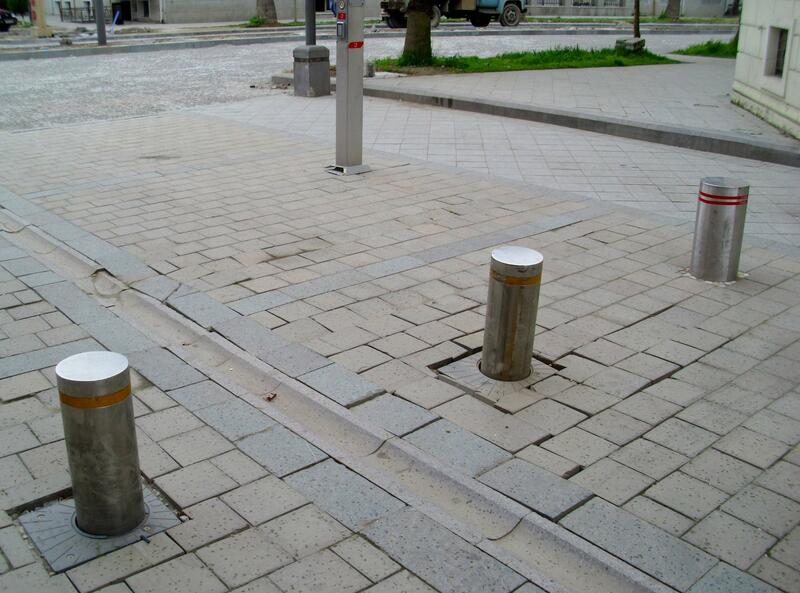 Rising bollards are used to secure sensitive areas from attack, or to enforce traffic rules that are time related or restrict access to particular classes of traffic. Not the answer you're looking for? Browse other questions tagged terminology technical generic generic-term or ask your own question. Does the term 'eccentric screw pump' have weird associations? Does “numeric” abbreviation eg i18n have a name? What is generic name for devices like this? Is this redundant phrasing a rhetorical device? Does it have a name? What is the generic name for a 'Yale lock'? Does this kind of bag have a specific name? Structure to avoid too many files in a single folder (ex: ab/cd/abcdef): Name of this technique? Does this type of watermark have a more specific name? Name for the literary device contrasting synonyms with different connotations?